Given about 90 percent of lung cancer cases caused by smoking. This is because the smoke will be inhaled entry into the lungs. Substances from tobacco smoke will stimulate the cells in the lung to grow abnormally. An estimated 1 out of 10 moderate smokers and 1 of 5 heavy smokers will die from lung cancer. Bladder cancer occurs in about 40 percent of smokers. Study finds high levels of the compound 2-naphthylamine in cigarette smoke carcinogens that lead to bladder cancer. Women who smoke are more at risk of developing breast cancer. The study shows women who started smoking at age 20 and 5 years before she got pregnant the first time greater risk of breast cancer. About 30 percent of deaths from cervical cancer are caused by smoking. This is because women who smoke are more susceptible to infection by a sexually transmitted virus. The study found that cigarette smoke damage the DNA of cells of the esophagus causing esophageal cancer. About 80 percent of esophageal cancer cases has been linked to smoking. Although cigarette smoke into the lungs, but there was some smoke that swallowed thereby increasing the risk of cancers of gastrointestinal (digestive). 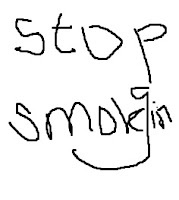 When a person smokes, the smoke containing nicotine and tobacco will go into the body. Nicotine along with other harmful chemicals such as carbon monoxide and tar cause changes in heart rate, respiration and blood pressure circulation. Carcinogens are filtered out of the body through the kidneys also alter DNA and cell damage kidney cells. These changes affect the function of the kidneys and lead to cancer.